Tinnitus affects nearly 50 million Americans, yet tinnitus education is not always readily available. To help you determine if you are struggling with tinnitus and what you may be able to address the issue, our hearing specialists at Hearing Healthcare Centers wanted to set the record straight so you can decide on what you need to do to manage your tinnitus. Often described as an inescapable ringing sound, tinnitus is a continuous sound which generally maintains the same level of loudness and frequency. While many people experience tinnitus as a ringing sound, others hear static, buzzing, whistling, roaring, and other continuous sounds. For someone who has not experienced tinnitus, it can be difficult to understand who simply hearing something can cause a problem since most forms of tinnitus can only be heard by the person struggling with tinnitus. However, tinnitus can impact your quality of life, as the continual sound can make sleeping difficult, can overpower your ability to hear other things and other life-altering issues. Limited Tinnitus - Most people will experience limited tinnitus at some point in their lives. This form of tinnitus only lasts for a few minutes up to a couple of days but will go away with a little time. However, limited tinnitus should be a warning sign to you, as it indicates that something was much too loud for your unprotected ears. Somatic Tinnitus - A less common form of tinnitus, somatic tinnitus is connected to your sensory system. When the sensory system in some people senses pain in the face, neck, head, arms, or other areas in the upper body, it can act as a trigger for their tinnitus. This type of tinnitus will often go away when the pain has been addressed. Objective Tinnitus - One of the most dangerous types of tinnitus, objective tinnitus is the only variation which can be heard by someone who is not experiencing the tinnitus. Generally, a hearing specialist will be needed to check for objective tinnitus, but if one of our specialists diagnoses you with this type of tinnitus, you will need to see a medical professional immediately. Objective tinnitus can be a sign that something is very wrong with your health, whether it deals with the physical structures in your ear or other health issues. Subjective Tinnitus - For most people who experience long-term tinnitus, they are dealing with subjective tinnitus, which can only be heard by the person experiencing the tinnitus. This form of tinnitus has no cure but can be managed with the right treatments. Along with different types of tinnitus, there are different ways tinnitus can be perceived by the person living with the tinnitus. Tonal Tinnitus - Most common of all the tinnitus perceptions, tonal tinnitus is heard as a continuous frequency. There can be more than one sound, but they will remain at the same pitch and volume. This type of tinnitus perception is usually found with those dealing with subjective tinnitus. Musical Tinnitus - Rarely found, musical tinnitus is perceived as singing or looping music, with the same musical bars being repeated. Pulsatile Tinnitus - Generally found in connection with somatic tinnitus, the perception of pulsatile tinnitus has the sounds coming in pulsing waves. Some people find this perception of tinnitus often pulses in time with their heartbeat. There are three basic ways which tinnitus can become trigger—sound-damage, medication, or health-related issues. Within these groups, there are more variations how tinnitus can be triggered. Considered the most common trigger for tinnitus, noise-induced damage is the most avoidable trigger as well. But many people don’t realize that many everyday sounds can lead to hearing loss and tinnitus. The two hearing issues are strongly connected with more evidence being found by researchers to support the link. 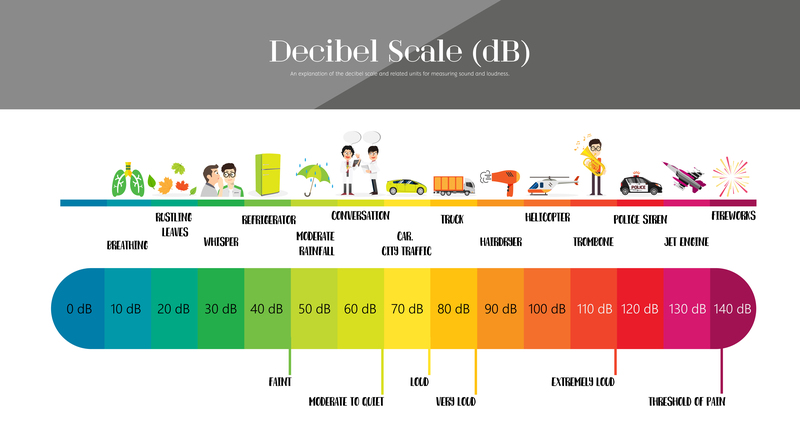 So, if you are exposed to decibels (dB) above 85-95 dB for a prolonged period of time, you could suffer from both hearing loss and trigger your tinnitus. This tinnitus trigger is also the most avoidable if you have the right hearing protection. Even if all you do is carry a pair of disposable earplugs, you can at least protect yourself from a good deal of hearing damage and triggering your tinnitus. There are types of medications which can both damage your hearing and trigger tinnitus, which are called ototoxic. However, they are not designated as ototoxic, so before you start a new round of medication, you should ask your doctor if the medication is ototoxic, as sometimes the ototoxic effects are permanent. Everyone can potentially experience tinnitus, especially since noise-induced tinnitus is so common. However, there are certain demographics which are more prone to struggling with tinnitus. Construction workers - While most manual labor jobs can put you in danger of triggering tinnitus, construction workers are often the most endangered, as build sites can generate high decibel levels even if you are not the one handling the power tools. Smokers - As smoking can damage the blood vessels in your body, your auditory nerve can become damaged from the lack of proper blood flow. Senior adults - Age-related hearing loss can also be accompanied by tinnitus. Musicians - Many musicians have developed tinnitus if they perform their music without hearing protection. Here at Hearing Healthcare Centers, we will do our best to help you manage your tinnitus with hearing aids that have tinnitus support. If your tinnitus is advanced beyond where hearing aids are helpful, our hearing specialist will be sure to help find a professional who can help you. To see if our hearing specialist can assist you with your tinnitus, contact us today for an appointment at one of our four hearing clinics.